CHELMSFORD, England — Vintage Cosmetic Co. is introducing two bath and body products at Ulta and online. 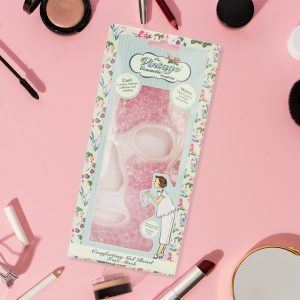 Following the launch of three products in Ulta in March, Vintage in late July/early August will roll out the Comforting Gel Bead Face Mask and Cosy Comfort Kit. The multipurpose and ergonomically designed Comforting Gel Bead Face Mask can be used warm or cool to achieve fresh and rejuvenated skin and has adjustable straps and soft backing for comfort. The warming function of the mask opens pores and soothes facial discomfort, while the cooling function closes pores after cleansing and can ease puffiness, swelling and even sunburn. cooled to soothe puffiness, swelling and headaches, or for added warm cosiness on chilly nights, making it a special, yet practical gift for a friend, or loved one. Vintage is a British brand best known for creating cosmetic accessories inspired by the charm of the 1950s. Popular with makeup artists and celebrities alike, the products make old Hollywood glamour accessible to busy, modern women across the globe. These classically inspired cosmetic accessories have been in the United States since 2015 and cover seven distinctive categories, inclusive of products ranging from false strip eyelashes and gift sets, to makeup headbands.